If you are to plant Echeveria, it’s important to determine if the seeds are fresh. In case they aren’t, this fact will significantly affect the number of seeds which are supposed to germinate. In addition to that, you need to sterilize the substrate and the planting container. You can sterilize the substrate by putting it in a microwave oven for at least 3 minutes, or in an oven for at least 45 minutes. On the other hand, you can sterilize the container by cleaning it with alcohol or by washing it with boiling water. The substrate that you’ll plant Echeveria in should contain the same quantity of garden soil, sand (with granulation around 0.07-0.15 inches (2-4 mm)) and perlite or pebbles (with granulation around 0.11-0.19 inches (3-5 mm)). Containers for planting should be deep around 1.5 inches (4 cm). Place pebbles into containers to improve drainage. Pour the substrate into containers, but not all way to the top. Leave at least 0.4 inches (1 cm) of empty space at the top of the container, so that the seedlings that germinated have enough space to grow. Water the substrate with the water you had boiled and left to cool down, and while you’re at it, take care to equally water the substrate. You can achieve this by submerging the container or by placing a piece of a napkin or a toilet paper on top of the substrate and slowly pour the water over it. Leave the container to drain out the water surplus. It’s desirable to use some kind of a fungicide while watering the plant. Spread the seeds over the substrate and take care that they’re not bundled up, leave some space between each one. Considering the fact that the seeds are so tiny, you can use a dry brush in order to place them. You can plant a larger number of seeds in one container. It’s extremely important that the substrate is not let to dry off completely until the seeds germinate. If you don’t want to constantly water it, the best option is to cover the container with a transparent foil or glass, or you can even put the whole container into a zip bag. The optimal temperature for Echeveria germination is 70°F (21°C). Night temperature can go below 68°F (20°C). You should avoid exposing the plant to direct sunlight. The best period to plant the seeds is spring, however, if you can control the necessary conditions, then you can plant the seeds during any time of the year. It’s desirable to open the container every day and let it ventilate for a short period of time. The germination process usually starts in 4 days, while most of the seeds germinate in a couple of weeks. After most of the seeds have germinated, start opening the container gradually so that the seedlings can get used to the new conditions. If you expose the seedlings to outer air all of the sudden, most of them won’t survive that drastic change. Seedlings can stay in the same container for a long time, they don’t mind the crowd. You can repot them only when you notice that they are space-limited and that it makes them stagnate. When repotting them, the seedlings should be taken out with a part of the substrate around the root, so as to preserve the root. Seedlings need a medium amount of moisture, their substrate shouldn’t be left to dry, and they need an ample amount of light – but not direct sunlight. Place: You can take care of Echeveria in a very bright place with a couple of hours of sunlight. If you leave the plant in a constant shadow, the plant will deform and the new leaves will be light in colour and tilted. Substrate: This plant belongs to a family of succulents, so it doesn’t need too nutritious a base for growth. The optimal substrate mixture for growth should contain garden soil, sand, pebbles, broken brick pieces… If you add a small amount of hummus then you don’t even need to fertilize it. Repotting: You should repot the plant after the blossoming occurs, but not every year. You should wait for the current container to become small for the plant, then repot it in a slightly bigger container and add fresh substrate. Watering: You should water the plant during summer only when the soil is completely dry. It’s for the best to water the plant abundantly and let the water decant completely. You shouldn’t water the plant during winter at all. However, if you notice that the plant needs it you can water it up to three times during the period from November to March. Be careful and don’t spill any water over the leaves when watering the plant. Wintering: Echeveria is not winterproof. This plant can spend winter on the temperature from 50 to 54°F degrees (from 10 to 12°C degrees). The plant can be at a lower temperature too, and you shouldn’t water it in that case. 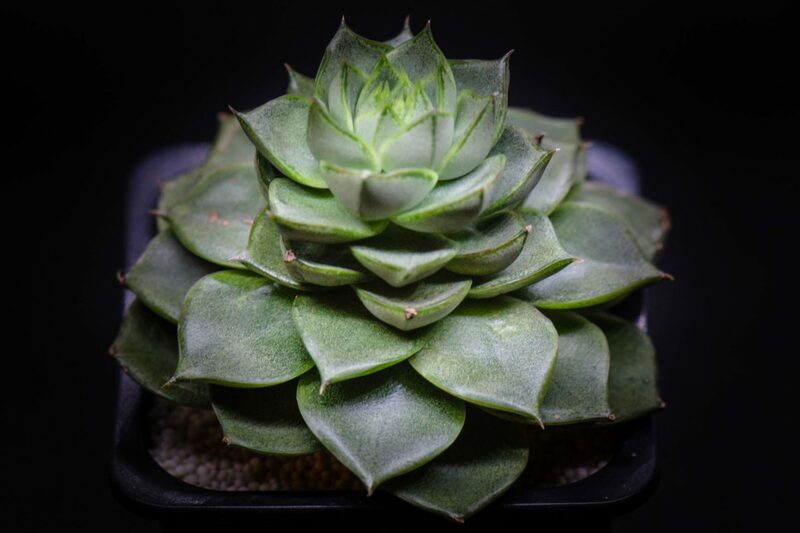 If you can’t provide these winter conditions for Echeveria, then take it in a warm room and place it on the farthest spot from the source of warmth, but at the same time, the brightest. Topdressing: this should be applied every three weeks or once a month, but only during the growth period (from May to September).